Isn't this just the sweetest framed piece? This is just one of the projects you can make at my Cuppa Love Card & Home Decor class in March. The Cuppa paper and Cuppa Framelits are new to the current Occasions catalog with products being available until May 31st. This is what I saw right away when I received my Cuppa Framelits. To make, run the foil, face down, on your cutting plates using the flatware (fork, knife, spoon) Framelits pieces through the Big Shot. You get essentially one chance to manipulate the flatware to the correct shape or the paper fibers break down. I gently teased up the fork tines and put a slight bend in the stem. The knife I left flat, of course! The spoon I curved the spoon bowl first, wrapping it gently around my thumb. Then I put the bend in the stem. 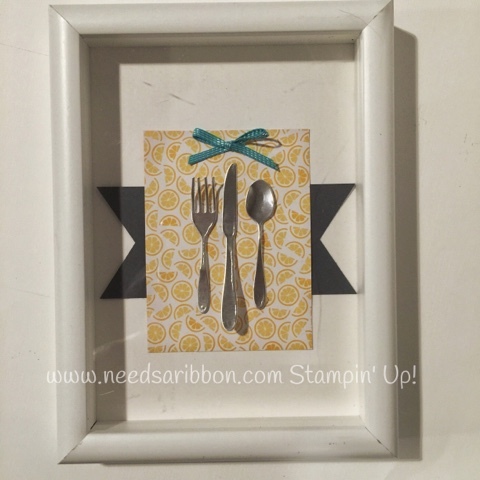 Another cute way to do this frame would be to run the ends of the flatware through an embossing folder, then forming the flatware. I used two glue dots per piece to adhere to the paper. This is a really cute and quick and easy piece. It would be very easy to change the papers to match your decor. I think a beginner with a Big Shot might be able to make this in a half hour. Imagine making this for a Mother's Day Gift or a housewarming gift or just because you have a spot on your wall that needs something. Class is $25. Can't make the dates but want the projects? $35 includes shipping.